While the Philippines has the second highest GDP growth rate among Southeast Asian countries, its adult population only has the fifth highest average net worth in the region, according to a report by Swiss financial services company Credit Suisse. In its latest edition of the Global Wealth Databook, Credit Suisse revealed that the average wealth of the over 60 million Filipino adults stood at $9,773 (Php492,603) for 2017. That was slightly lower than the country’s $9,878 average reported in 2016. Compared to other members of the Association of Southeast Asian Nations (ASEAN), the average net worth of Filipino adults puts it in the middle of the 10 countries. Singapore had the highest average wealth per adult in the region at $268,776, which made it the ninth highest average in the world. Brunei follows suit with an average net worth of $43,151, while Malaysia and Indonesia both rank above the Philippines with average wealth per adult at $22,804 and $11,001 respectively. Myanmar saw the lowest average net worth of the region at $1,831. Except for Singapore and Brunei, a majority of adults in most ASEAN countries have a net worth under $10,000, suggesting high inequality in wealth distribution. Indeed, in half of the 10 ASEAN members, over 90 percent of adults have accumulated less than $10,000 in wealth. 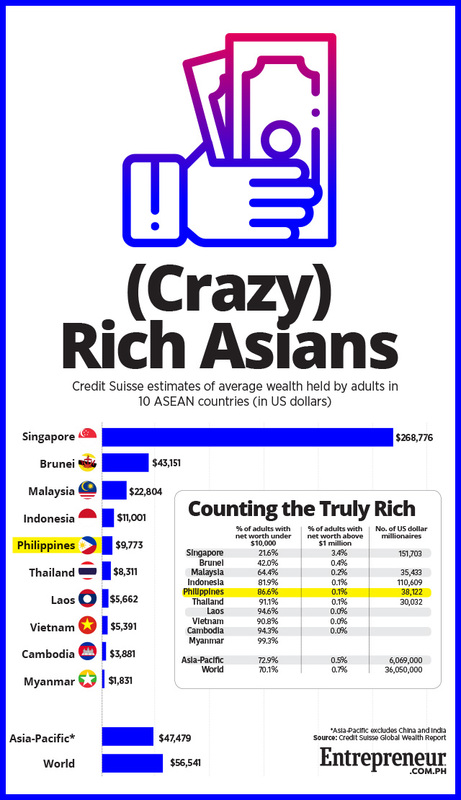 In terms of the number of dollar millionaires, the Philippines ranked third in the ASEAN, with 38,122 Filipinos enjoying a net worth of at least $1 million (Php50.4 million). Among the five countries with available data on the number of dollar millionaires, Singapore was still on top, with 151,703, while Thailand had the least with 30,032.